You love your new apartment in the city, but the floor-to-ceiling windows are skyrocketing your energy bills. That's when this Metal Folding Drying Rack swoops to save your day with all 30 ln. ft. of its natural drying capabilities. The smooth metal exterior cradles your favorite silk scarves, mesh tops and sports bras with ease. And when it's done extending the life of all your favorite pieces, it folds up into its own easy piece that can be stored between the washer and dryer, against the laundry room wall or at your mom's house. This Greenway multi-purpose hamper is not only attractive but functional, too - use as laundry bin, a toy sorter or for storing other household items. Features a central divider to keep items neatly organized and contained. Designed to last, the interior of the fabric-covered walls are made from plastic, not cardboard, for both durability and as a mold and mildew deterrent. This multi-purpose hamper is not only attractive but functional, too - use as a laundry bin or for storing other household items. Flip-top lid is attached and has 3 wide sides that fit snuggly when closed. Designed with premium plastic interior support walls, ensuring superior product stability while also deterring mold and mildew growth. Easy to set up and folds down compactly for storage when not in use. Holds 22 lbs / 10 kg; volume capacity is 78 L / 20.8 gallons. The Hazelton 18 inch wide Laundry Hamper in an antique gray finish sits on beautiful, arched feet. A tilt-out door with a metal handle makes it easy to toss your clothes in, and just as easily get them out on laundry day. This transitional style clothes hamper keeps dirty clothes hidden and blends in with the rest of your bathroom pieces and decor. Also available to purchase are matching vanities in a variety of sizes; 31 inch (HZAGV3122DTB), 37 inch (HZAGV3722DTB), 49 inch (HZAGV4922DTB) and 61 inch (HZAGV6122DTB). Matching accessories include; a mirror (HZAGM3030), medicine cabinet (HZAGM2428), wall cabinet (HZAGC2528) and linen tower (HZAGL1867). Wicker Corner Hamper with Liner. A nice solution for small bedrooms and baths, this naturally beautiful corner hamper looks as good as it is functional. Capable of storing multiple loads of laundry, it is manufactured from a moisture resistant material. Includes a machine washable cotton canvas liner that can be easily removed for cleaning. Keep clothes off of the floor and your space neat and clean with this wicker-style hamper. X-Frame Folding Metal Drying Rack You love your new apartment in the city, but the floor-to-ceiling windows are skyrocketing your energy bills. That's when this Metal Folding Drying Rack swoops to save your day with all 30 ln. ft. of its natural drying capabilities. The smooth metal exterior cradles your favorite silk scarves, mesh tops and sports bras with ease. And when it's done extending the life of all your favorite pieces, it folds up into its own easy piece that can be stored between the washer and dryer, against the laundry room wall or at your mom's house. 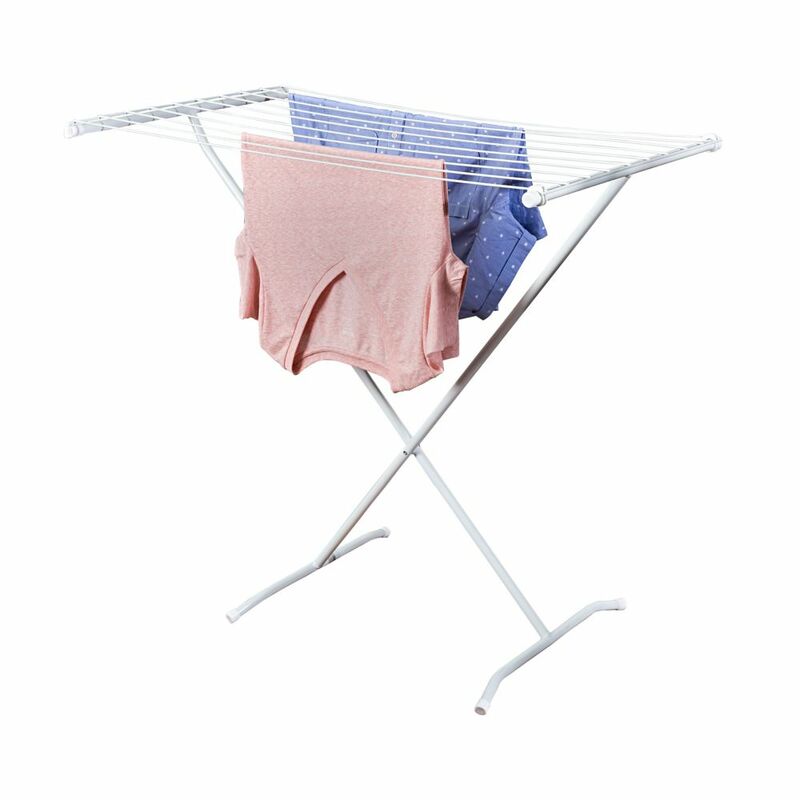 X-Frame Folding Metal Drying Rack is rated 4.4 out of 5 by 33. Rated 4 out of 5 by Val from The Metal Folding Drying Rack is good, but not as good as the one I had before. The old model ha... The Metal Folding Drying Rack is good, but not as good as the one I had before. The old model had on both sides (or both ends) a bar where I could hang small items like socks, gloves, etc. When folding it it did not glide like the new one but the top had to be flipped over. On one end it had two hooks to hook the top part on to the side. It also was sturdier than the one I recently purchased. Rated 5 out of 5 by Christina from I love it. It's small, light weight, opens and closes... I love it. It's small, light weight, opens and closes quickly, stores easily. Only issue is that if you have winds, it's so light weight you need to anchor it with a little more weight. It holds about 1 regular size load of laundry. Perfect for what I was looking for. Rated 4 out of 5 by Yellow from Exactly what I was looking for. Easy to set up... Exactly what I was looking for. Easy to set up and store back. Good price as well.